Akron/Cleveland 440-655-1348 James Cramer, P.E. Cramer Engineering, LLC is a comprehensive structural engineering consulting firm that serves multiple industries such as commercial, industrial, and residential. We specialize in structural, and forensic engineering on any project, big or small. Cramer Engineering has an office in Akron, OH. 92 ft span truss bridge. 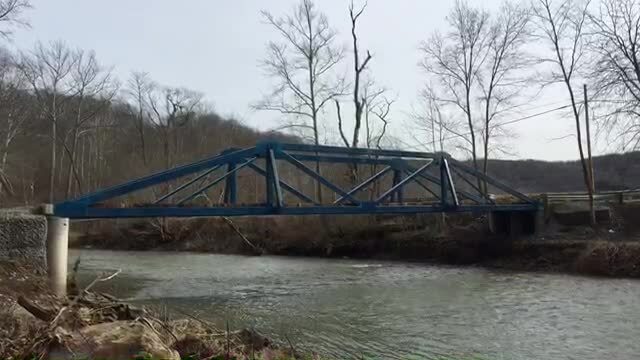 Steel tube trusses with timber bridge deck for a private residence on Yellow Creek, OH. Design Build by Cramer Engineering. Project was completed on time and on budget in 2016. Cramer Engineering worked with the City of Ashland and the Ohio EPA to take the first major step toward the site's cleanup and future demolition. We marked which portions of the old buildings are unstable, and the environmental scientists took samples of the fallen debris and other materials within the deteriorating buildings. Cramer Engineering was hired to design and value engineer the zip line adventure course at the Toledo Zoo, in Toledo, OH. The course consisted of four separate wood towers linked by 100ft+ suspension rope bridges. The course was commissioned in April of 2016. Cramer Engineering inspected and analyzed the tandem zip line towers for structural integrity. 32 ft tall addition to the Lanxess Chemical plant in Chardon, OH. Cramer Engineering served as the lead engineer for the project from conception, zoning, permitting and construction administration. Cramer Engineering provided structural and steel shop drawings for this large steel framed and brick masonry deck. Cramer Engineering provided concrete and steel design for the above-grade pool that is built into the house. This pool utilized parallel chord steel scissor trusses.